Cover the whole outline with building:part=yes areas. These areas may overlap each other or may be disjunct, which depends on the actual building. Avoid using building:parts with overlapping 3D volumes if possible, especially if the volumes would have common faces. Use building:part=yes only for those parts, which differ from the overall building. This case requires a building relation where the building=* outline has the outline and the parts building:part=* have the part. Split the building into horizontal slices (floors stacked on top of each other) and add to each part building:levels=*, building:min_level=*, height=*, min_height=* tags. building:material=* Outer material for the building facade. 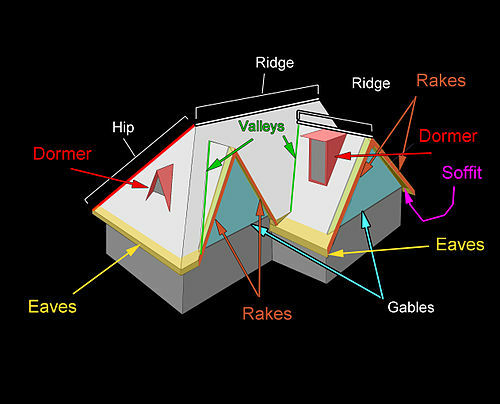 roof:material=* Outer material for the building roof. Köln, Wohngebiet in Neuehrenfeld als "Labor"
An image can help to understand some architectural terms. OpenScienceMap -  Interprets only height/min_height tags client-side. The S3DB Layer uses vtm meshes generated on the server (using plpgsql with PostGIS and SFCGAL). This page was last edited on 18 October 2018, at 06:28.